You search for new and used Jeeps for sale ends here with Ewald Chrysler Jeep Dodge Ram of Oconomowoc Wisconsin, where you can browse through a very broad and diverse selection of impressive and reliable new and used Jeeps for sale. Ewald Chrysler Jeep Dodge Ram has plenty of new and used Jeeps for sale in Oconomowoc, from used Jeep Grand Cherokee's to new Jeep Wrangler Unlimited's for sale and much more, giving Jeep fans like yourself plenty of variety to choose from when seeking your next new or used Jeep for sale. 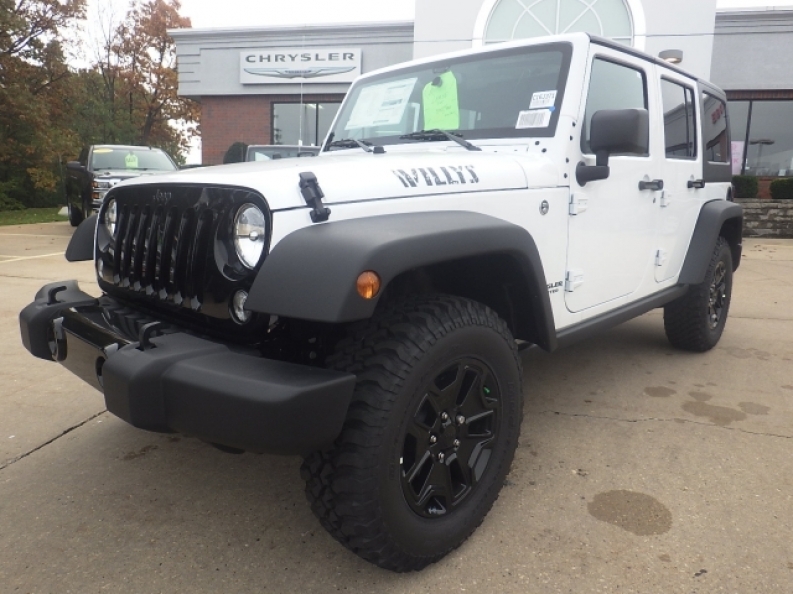 So for affordable, reliable, and powerful new and used Jeeps for sale, stop on in to Ewald Chrysler Jeep Dodge Ram of Oconomowoc Wisconsin today and check our our Jeeps like this brand new Jeep Wrangler Unlimited for sale, the 2016 Jeep Wrangler Unlimited Willys Wheeler. This new Jeep Wrangler Unlimited for sale has a lot to offer drivers everywhere, providing you with many fantastic features and aspects to enjoy. This new Jeep Wrangler for sale provides drivers with a large boost in speed of up to 285 horse power, getting you where you want to go and fast, as well as supplying you with a powerful maximum towing capacity of around 2000 pounds so you can bring along almost anything that you want to take with you. In addition to the great speed and hauling power that this impressive new Jeep logo vehicle has to offer you, this new Jeep Wrangler Unlimited for sale also sports a wide variety of incredible features to enjoy, such as a fancy Rollover Protection System, and a Leather Wrapped Steering Wheel for increased style, as well as Electronic Stability Control	for improved safety and more. If you want to check out all of the amazing features that this new Jeep Wrangler Unlimited for sale has to offer you, then stop on in to Ewald Chrysler Jeep Dodge Ram of Franklin Wisconsin today, located here at 36833 E Wisconsin Ave Oconomowoc, WI 53066.